Making cake for a birthday can be a lot of fun. It brings out your creative side and also gives you an opportunity to experiment a little. In recent times, there has been a lot of emphasis on theme based birthdays for kids, and at the centre of this concept is mostly the cake, which is decorated accordingly. Making a character cake is very hard and takes a lot of skill and concentration to be make it perfectly. However, if you work hard enough and know about the steps in the process, this can be done with relative ease. You require a few things and you are good to go. The first step is to level the top of the cake, once it has been baked and has cooled down. Remove the humps from the top carefully using cake leveller. Cut the cake into half horizontally using the same cake leveller. Put frosting in between the two parts of the cake. Fill in well and be sure that the spread is consistent. Once done, assemble the cake once again carefully so that the parts are exactly levelled. Put the frosting on the side of the cake in a uniform manner and then on the top of the cake. Use a flat spatula to level the frosting. Now take out the cake that you have made in the character mould. Place it carefully on top of the cake once the frosting has settled well. Make sure that it does not break while you take it out of the mould and also when you are placing it on top of the base cake. Now you need to decorate the character as per its original look. For this purpose, you will need a lot of coloured frosting. Make sure that you have all the right colours available with you. Carefully add it on the character. 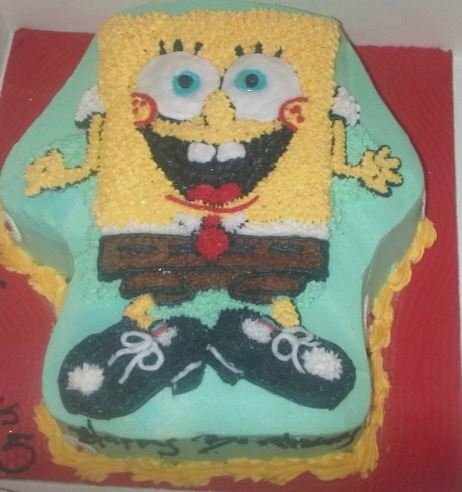 Once the character has been decorated, the next step is to decorate the sides of the cake. This is where the most creativity kicks in since you will need to make sure that the character and the sides are well incorporated. It is never a bad idea to add some bright coloured borders to the cake.